MDaemon Messaging Server, email server software, is a trusted alternative to Microsoft Exchange or SBS. MDaemon mail server supports IMAP, SMTP, POP3, and ActiveSync protocols and delivers solid performance from its feature-rich and user-friendly design. MDaemon® Messaging Server, email server software, supports IMAP, SMTP, and POP3 protocols and delivers solid performance from its feature-rich and user-friendly design. 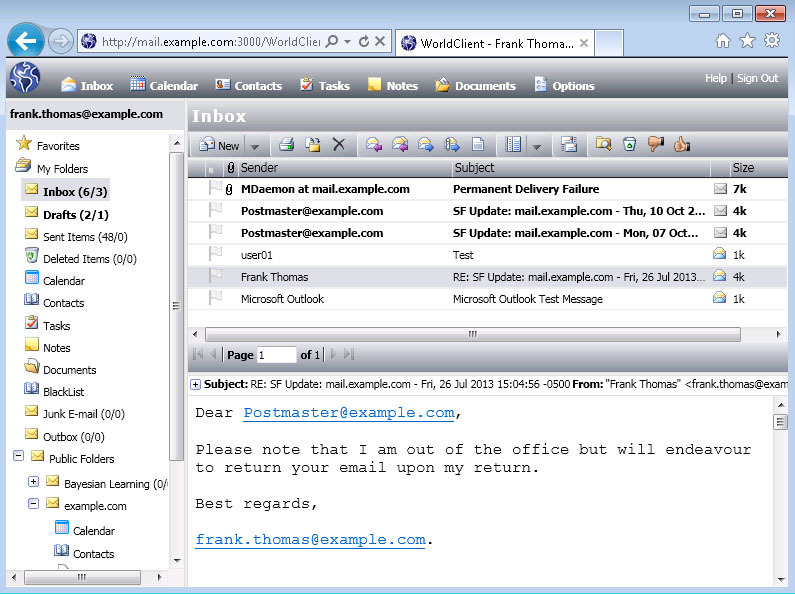 A trusted alternative to Microsoft Exchange or SBS, the MDaemon Messaging Server provides outstanding groupware features, integration with Microsoft Outlook (using Outlook Connector for MDaemon) and a multi-language webmail client for email access anywhere. MDaemon Messaging Server supports most mobile devices with access to email, calendar, and contacts. For organizations that want simplicity, affordability, and compatibility between an on-premise email server and their BlackBerry smartphones, MDaemon includes support for BlackBerry® push email with a seamless management experience. MDaemon users can follow the simple and intuitive user interface to quickly set-up and receive push email delivery from the mail server to their favorite BlackBerry smartphone. The MDaemon Messaging Server is a leader in email security using a layered approach (with SecurityPlus for MDaemon) offering proactive protection against email-borne threats of spam, viruses, and phishing. MDaemon Messaging Server uses the advanced email authentication techniques of Vouch By Reference (VBR) and validates and signs messages using DKIM, DK, Sender-ID, and SPF. MDaemon Messaging Server is a globally trusted mail server and a solid alternative to Microsoft Exchange or SBS, with prices starting as low as $135.00. Buy now or download a free 30-day fully-functional trial to experience its powerful features, easy administration, and low total cost of ownership for your business.